If you've been racking your brain for winter getaway ideas, you may want to set your sights on the Mediterranean. 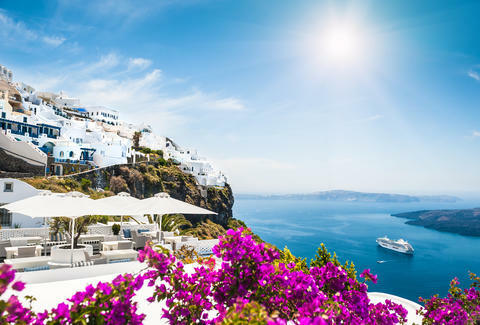 That's because you can score nonstop round trip flights from New York to Greece for just $352 right now, as long as you act fast. Better yet? It's on Emirates Airlines, which is considered one of the best (and not just by Jennifer Aniston). The deal, which is similar to one that ran earlier this year, features crazy-good fares on a bunch of flights from Newark's Liberty Airport to Athens, especially if you're willing to book two or more tickets at the same time (get your squad together and make it happen!). As is tradition with Emirates promotions like this, the more seats you book, the lower the price. And while you can still get a decent deal booking a single roundtrip ticket (around $433), the real steal here is to get four or more pals and book 'em together -- that'll bring the price down $353 apiece. As with any flight deal, there's some fine print worth noting. Specifically, to get in on this you'll need to travel between September 26 and December 18 or December 25 and March 30, and you must stay for at least four days. However, Emirates is far from a budget airline, so you won't be paying extra to check your bag. In fact, you can check two bags for free. You'll also want to book soon, because the promotion expires 11:59pm on September 21.